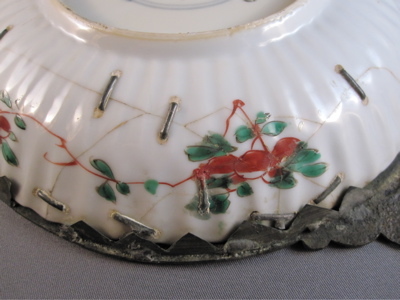 Every one of these six matching broken Chinese export porcelain plates is held together with large brass staples, visible only from the back. 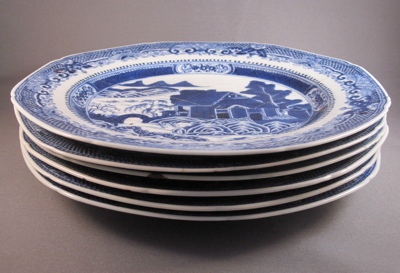 I imagine the complete set of dishes was much larger than the six repaired examples I own, but I am thankful someone weeded out the “perfect” ones and left me with the more interesting much preferred damaged goods! 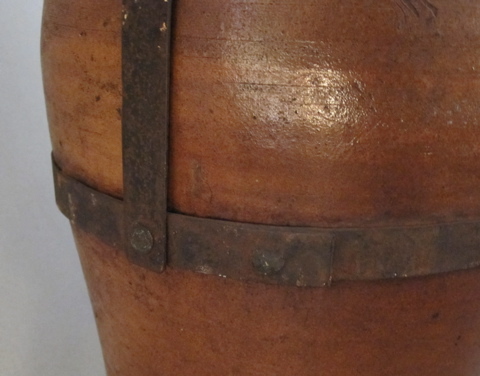 Out of all of the different types of inventive repairs I have shown thus far, people seem to be the most fascinated with staple & rivet repairs. 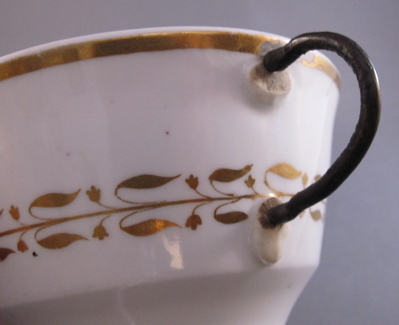 I will be showing rare illustrations and photos documenting this repair procedure in upcoming posts, so please stay tuned. 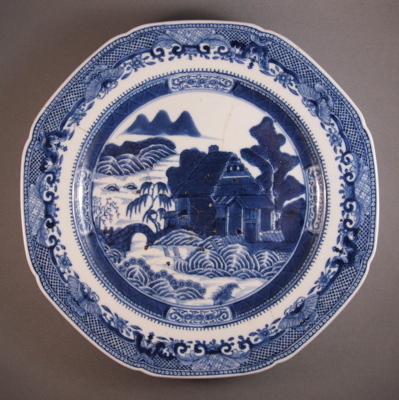 Plate 1, The champion with 14 staple repairs. Plate 2, another winner and tied for first place with 14 staples. 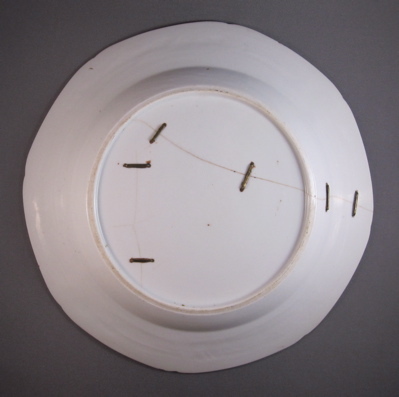 Plate 3, repaired with an impressive 9 staples. 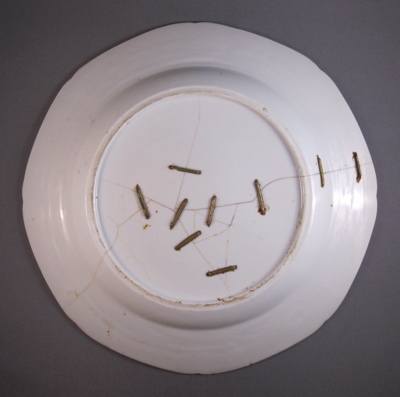 Plate 4, not too shabby with 8 staples. 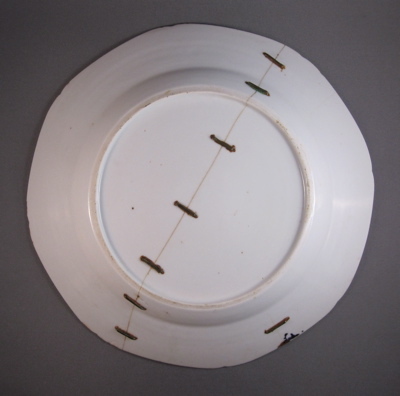 Plate 5, another plate with 8 staple repairs. 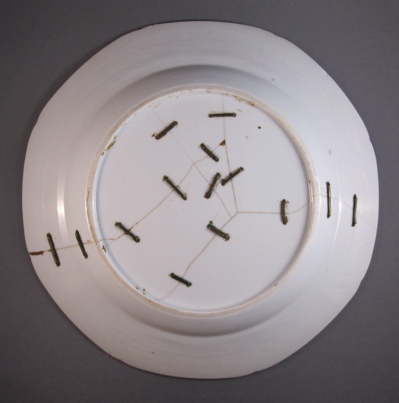 Plate 6, still lovely with an impressive 6 staples. 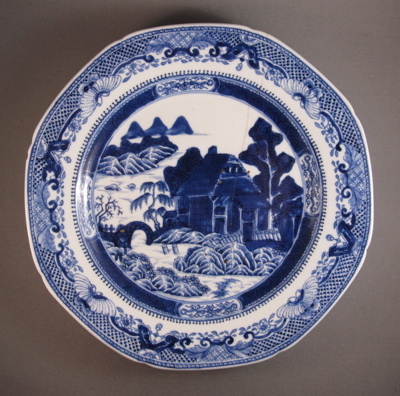 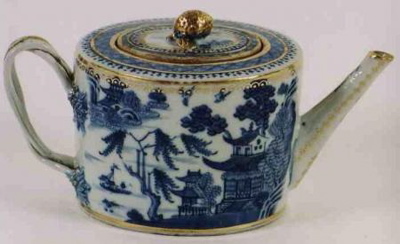 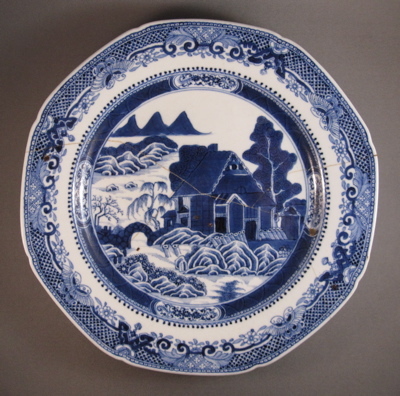 This detail shows the rich cobalt blue under glaze “log cabin” or timber frame decoration, inspired by an English design by Spode. 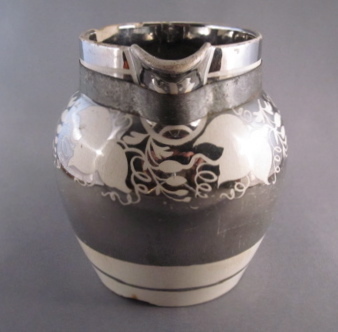 This pattern is also known as “trench mortar”. 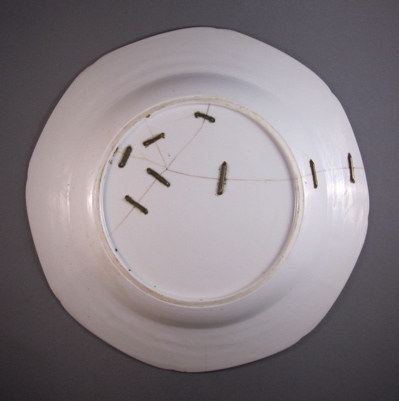 Each plate measures 9-1/2″ in diameter. 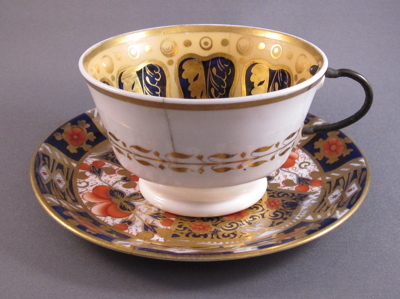 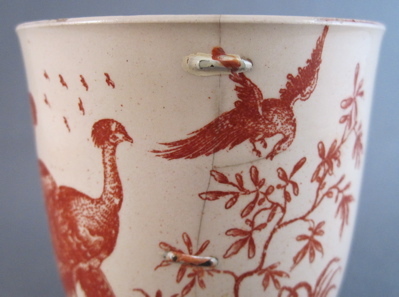 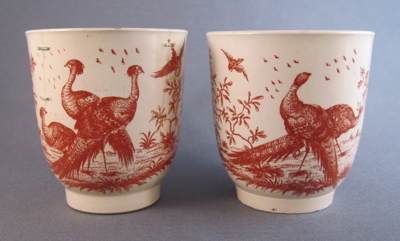 Although found together, this Victorian bone china teacup has nothing at all to do with the Imari patterned saucer, as they were “married” sometime after the saucer went missing. 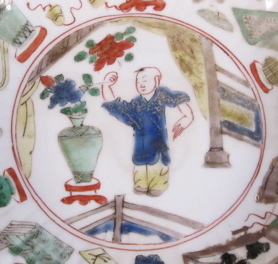 The only mark on the teacup is “2/1247”, hand painted in red on the bottom. The undamaged saucer is marked “Pointons England” on the bottom and dates from 1891. 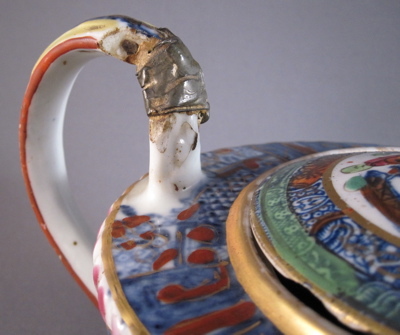 I would have been thrilled had the saucer also been a recipient of an inventive repair! 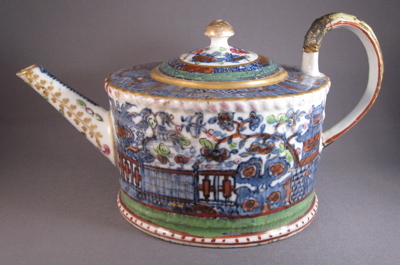 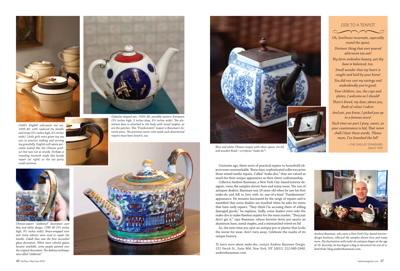 The current issue of Tea Time magazine (May/June 2010) contains an article featuring teapots with inventive repairs from my collection, written by author and tea expert Elizabeth Knight. 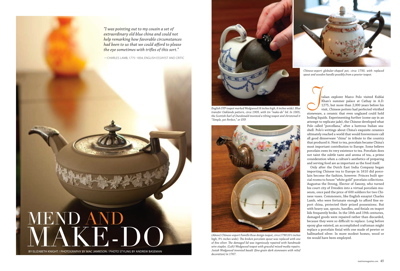 Tea Time creative director and photographer Mac Jamieson flew up from Alabama to shoot this story in my NYC apartment. 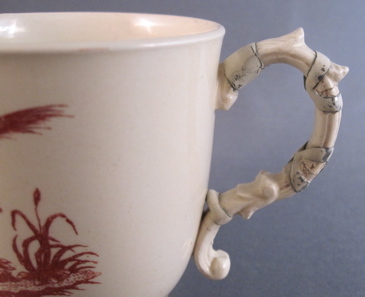 He and editor Lorna Reeves were a pleasure to work with and both exuded southern charm! 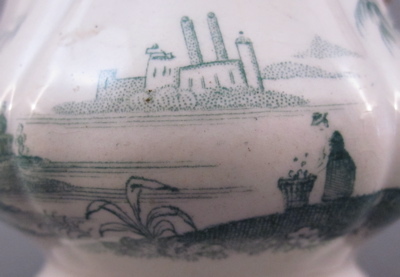 This small pottery creamer from a child’s tea service is 3 inches tall and has green transfer decoration depicting a woman with a basket of flowers and a castle in the distance. 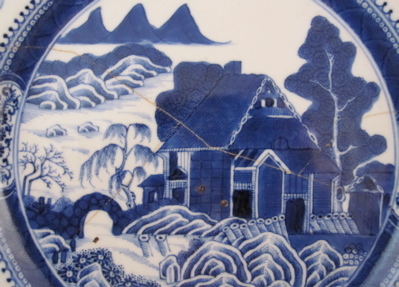 This close up shows the pointillist transfer decal decoration in “high definition”. 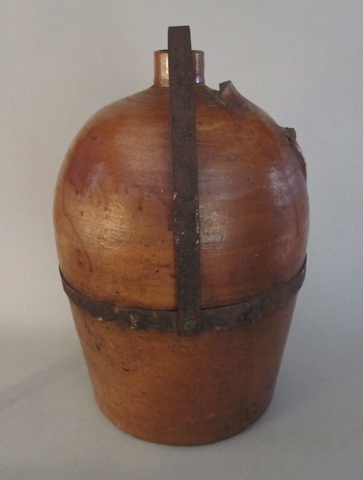 A crudely made copper armature was attached as the base structure for a replacement handle. 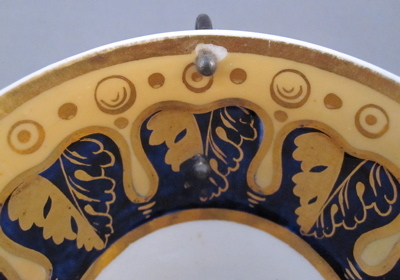 Many layers of gesso and enamel matching the original colors were applied over this, but have since fallen away. 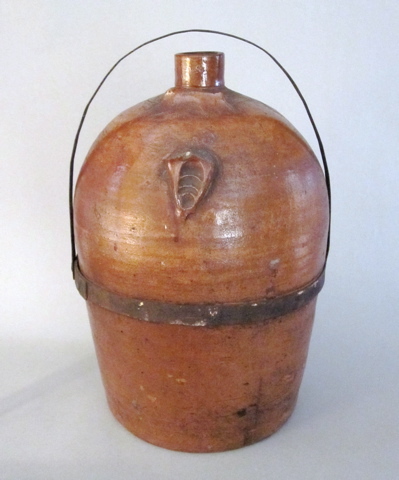 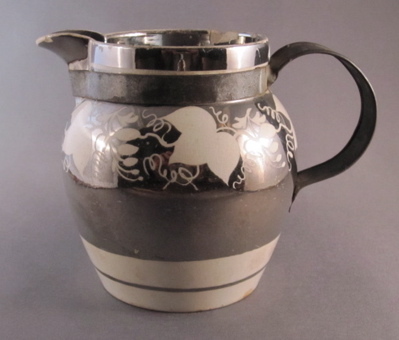 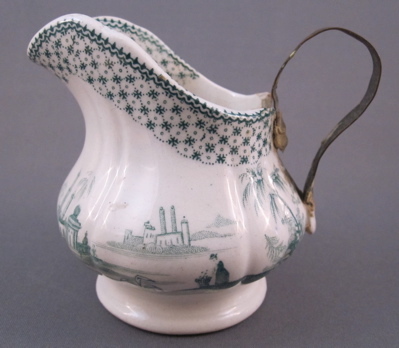 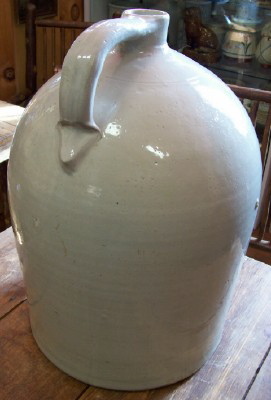 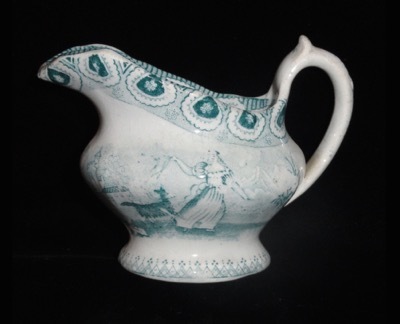 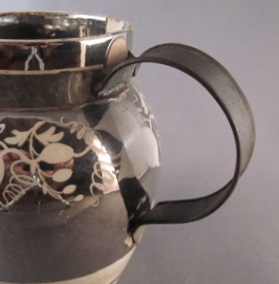 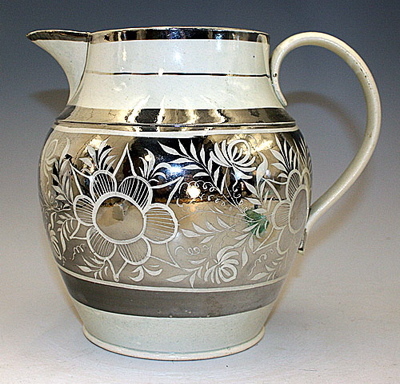 Another jug with similar form and decoration suggests what the handle on my little jug may have looked like. 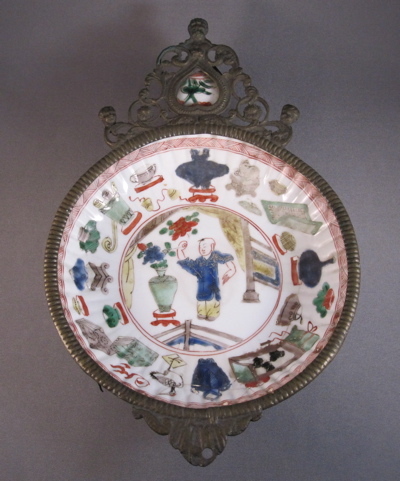 A ribbed surface Chinese porcelain dish with the “Hundred Antiques” pattern is decorated in a famille verte palette, depicting culturally significant items of the period including vases, textiles and utensils. 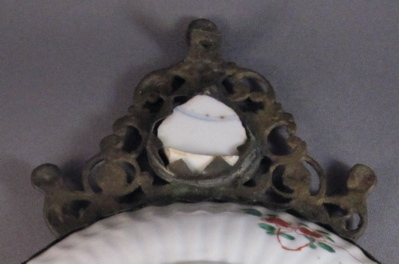 After the dish broke and was repaired with metal staples, it was placed in an elaborate circa 1750 bronze rococo mount with cherubs. 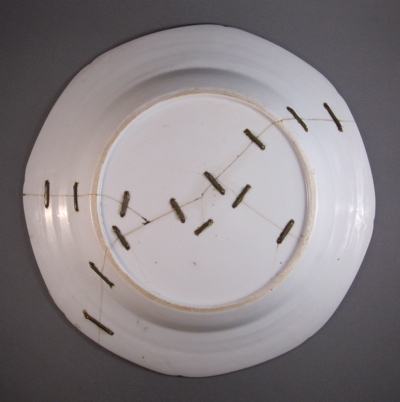 10 metal staples were used to hold this dish back together again. 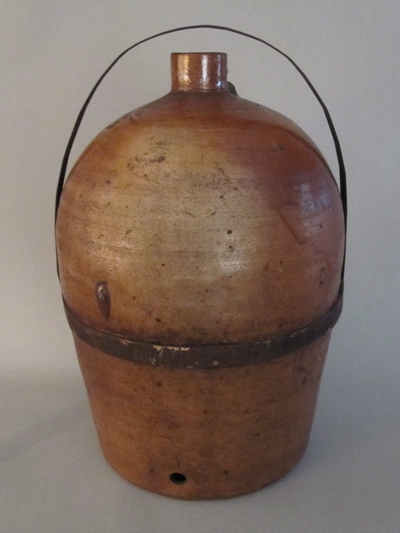 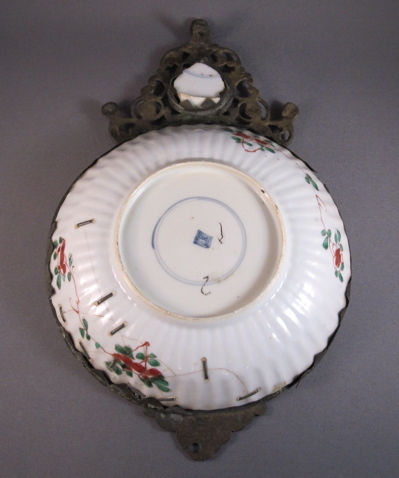 The dish alone is 6″ in diameter and measures 9-3/4″ long including the added bronze mount. 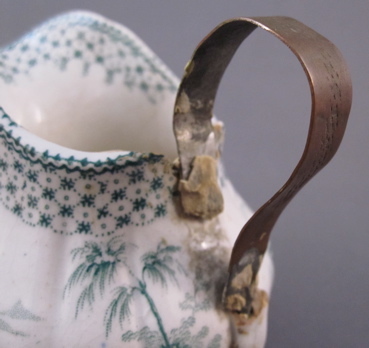 An unusual detail is a porcelain fragment from another broken object, added to the top portion of the mount. 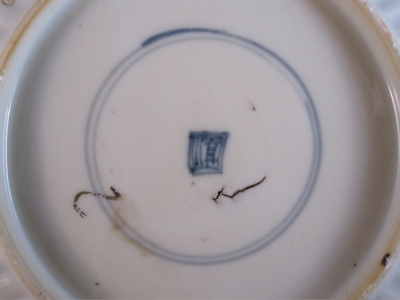 If anyone has information on this mark, please let me know.